Diabetes accounts for more than nine percent of the total health impact of 200 health conditions affecting individuals within the 18-34 age group, according to the BCBS Health Index-generated ‘Diabetes and the Commercially Insured U.S. Population’ study. The study looked at the health implications of diabetes compared to over 200 health conditions, as well as its connection to age, obesity trends and region. 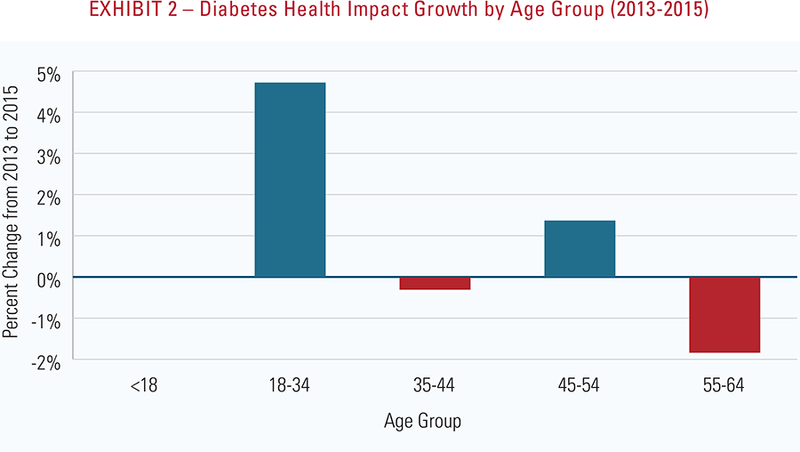 Individuals in the 18-34 age range experienced nearly a five percent growth of Type 2 diabetes diagnoses, making it the largest increase. 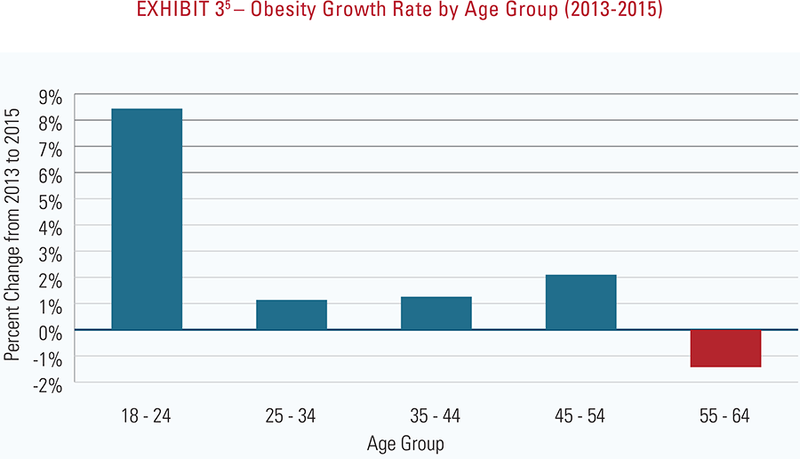 This number can be explained when looking at the eight percent increase in obesity in the same age group. The link between diabetes and obesity can be known as ‘diabesity’, meaning the two health conditions are associated with one another. It is important to remember that Type 2 diabetes is a preventable chronic condition impacted by an individual’s lifestyle habits. For this reason, it’s vital for individuals to know the difference between the uncontrollable and controllable risk factors that contribute to these diagnoses. However, the list of controllable risk factors is more extensive and allows for an increased opportunity to make healthy choices that greatly impact the risk of these conditions. Following the guidelines associated with controllable risk factors can help individuals to be healthier and lower their chance of developing Type 2 diabetes. Nutrition: Individuals can control their nutrition by making healthier food and drink choices, managing portion sizes, eating at appropriate times throughout the day and avoiding unhealthy cooking methods. It is just as important to stay hydrated; adults should drink at least 64 ounces of water per day, or half their body weight in ounces. Fitness: It is recommended that adults have at least 150 minutes of moderate activity per week. Individuals should also become more aware of sedentary time, especially extended periods of sitting, to help them be proactive about scheduling exercise regularly. Adjusting screen time is also important, as the rapid development of technology could play a role in the increase of sedentary behavior and lack of physical activity which may increase overweightedness and health decline in younger generations. Sleep: Individuals should be getting the recommended amount of quality sleep. For example, young adults should maintain a sleep schedule of seven to nine hours per night. When an individual improves their sleep schedule it also improves their overall physical health. Stress: How stress and anxiety are managed also plays a role. Stress can elevate blood sugars and increases the body’s cortisol levels. If this hormone remains high for an extended period, it can make it harder to lose weight and even cause individuals to gain weight. Drugs: This use of alcohol, tobacco and other drugs can have a negative impact on the body’s overall health and increase the risk of preventable diseases such as Type 2 diabetes. 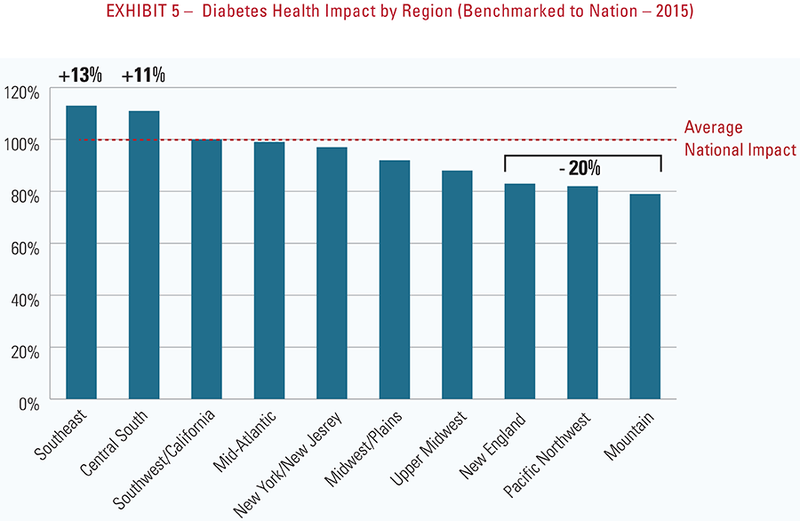 The study also found that diabetes has the highest health impact on communities in the Southeast and Central South areas of the United States—approximately 50 percent higher than the national average. These regional health implications can be linked to cultural eating habits and norms. For example, in the Central South region of the United States, the Hispanic population is higher. already has a higher predisposition to Type 2 diabetes. To help prevent Type 2 diabetes, individuals can make the choice to use healthier alternatives when cooking traditional recipes. Easy ingredient alternatives could include using refried beans instead of black beans and a whole wheat tortilla instead of a white one when making a burrito. For individuals that have already been diagnosed with Type 2 diabetes, it is also important to follow these recommendations to properly manage the condition. It’s important to regularly visit a primary care physician and take medications as prescribed.